Reverend Joseph Harrison Jackson was the pastor of Olivet Baptist Church in Chicago, Illinois (1941–1990), the longest-serving president of the National Baptist Convention (1953-1982), and a leading conservative voice during the Civil Rights era. To this day, Rev. Jackson remains a deeply controversial figure, in part due to his opposition to Dr. Martin Luther King Jr. and his strong critiques of civil disobedience and the “black power” movement. Rev. Jackson was a passionate advocate for what he called a “law and order” approach to civil rights. He championed participation in democratic processes, putting emphasis on the ballot, and discouraged protest marches, boycotts, sit-ins, and other “direct action” means of achieving African American civil rights. Rev. Jackson was a Republican and, to this day, remains regarded highly by many conservatives. Joseph H. Jackson was born on September 11, 1900, on a farm near Rudyard, Mississippi. He taught himself to read, write, and do arithmetic. While working on the farm and studying, he began preaching at an early age in nearby counties. Rev. Jackson received a bachelor’s degree from Jackson College (now Jackson State University) in Mississippi in 1926. He earned a B.D. from Colgate Rochester Divinity School in New York (1932), and a master’s from Creighton University in Nebraska (1934). From 1934 to 1941, Rev. Jackson served as the minister of Monumental Baptist Church in Philadelphia, Pennsylvania. In 1941 he moved to Chicago, Illinois, after being appointed pastor at the historic Olivet Baptist Church, the largest black church in the state. He continued to serve as pastor there until his death in 1990. 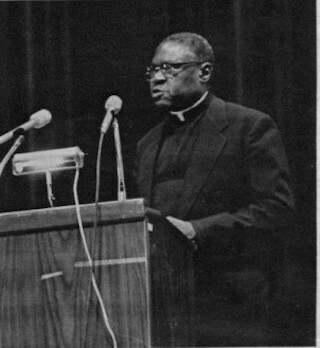 In 1953 Rev. Jackson was elected president of the National Baptist Convention. He was the longest-serving president, holding the position for twenty-nine years. His long tenure was controversial and inspired challenges to his leadership by Dr. Martin Luther King and other dissidents from 1956 until 1962 when they withdrew from the National Baptist Convention and founded the Progressive National Baptist Convention. Jackson continued to serve as the president of the National Baptist Convention until he was unseated in September 1982 by Rev. T.J. Jemison. While Rev. Jackson’s controversial legacy of conservatism and qualified support of the Civil Rights Movement usually framed descriptions of him, it is important to note that he did strongly support civil rights legislation. He opposed civil rights organizations such as Martin Luther’s King’s Southern Christian Leadership Conference (SCLC) and the Student Nonviolent Coordinating Committee (SNCC) that advocated civil disobedience and other forms of protest. Rev. Jackson viewed equal rights as fundamentally patriotic as long as the tactics used to achieve those rights fell under his “law and order” approach. On August 20, 1990, Reverend Jackson died in Chicago at the age of eighty-nine. He was survived by his wife, Maude Thelma Jackson, and daughter, Dr. Kenny Jackson Williams. “Reverend J.H. Jackson Papers,” The Black Metropolis Research Consortium, BMRC, Chicago History Museum, https://obrikati.files.wordpress.com/2013/07/reverend-j-h-jackson-papers_findingaid.pdf; “Joseph H. Jackson.” Project Gutenberg Self-Publishing Press, World Heritage Encyclopedia, http://www.gutenberg.us/articles/joseph_h._jackson; “Jackson, Joseph Harrison (1900-1990),” Martin Luther King Jr. and the Global Freedom Struggle, Stanford University, http://kingencyclopedia.stanford.edu/encyclopedia/encyclopedia/enc_jackson_joseph_harrison_19001990.1.html.